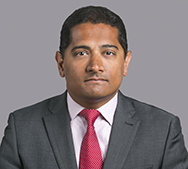 Sandy Bhogal is a partner in the London office of Gibson, Dunn & Crutcher and a member of the firm’s Tax Practice Group. Mr. Bhogal experience ranges from general corporate tax advice to transactional advice on matters involving corporate finance & capital markets, structured and asset finance, insurance and real estate. He also has significant experience with corporate tax planning and transfer pricing, as well as with advising on the development of domestic and cross border tax efficient structures. He also assists clients with tax authority enquiries, wider tax risk management and multi-lateral tax controversies. Mr. Bhogal is listed as a leading tax adviser in Chambers and Legal 500. Prior to joining Gibson Dunn, Sandy was head of tax at Mayer Brown, and prior to that was associated with Ernst & Young LLP and with a leading international legal practice.